Low levels of radioactivity have been discovered in the cooling waters of a nuclear submarine test reactor at Dounreay, Defence Secretary Philip Hammond has said. Mr Hammond told MPs that no leak had occurred and said there were no safety implications for staff working on the site, or risks to the environment. But, as a result, HMS Vanguard is to be refuelled with a new nuclear core at a cost of £120m. The problem was discovered in 2012. Labour criticised the government for not announcing the information earlier, calling it a matter of “national importance”. Although the news is only being made public now, the Ministry of Defence says the Scottish Environment Protection Agency and the defence nuclear inspectorate were kept informed. Mr Hammond said the Vulcan Naval Reactor Test Establishment ran at higher levels of intensity than those on Britain’s fleet of nuclear submarines and was designed to pre-empt any similar problems with the reactors on board those vessels. The defence secretary said: “These low levels of radioactivity are a normal product of a nuclear reaction that takes place within the fuel but they would not normally enter the cooling water. “This water is contained within the sealed reactor circuit and I can reassure the House there has been no detectable radiation leak from that sealed circuit. The refuelling of HMS Vanguard – the UK’s oldest nuclear submarine – will take place during its next scheduled “deep maintenance period”, due to last three and a half years from 2015. Mr Hammond said a decision on refuelling the next-oldest submarine, HMS Victorious, would not need to be taken until 2018. 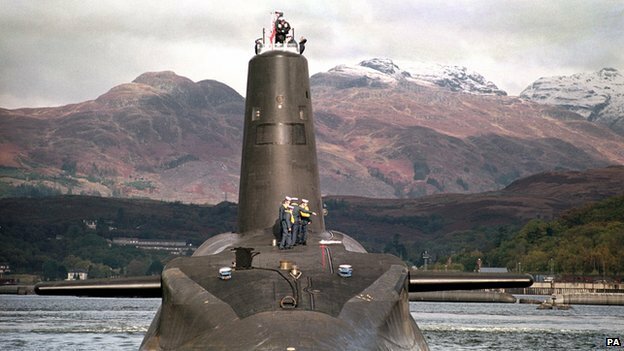 New submarines for the Trident replacement programme, known as the Successor submarines, will not be affected by the problem, he added. For Labour, shadow defence secretary Vernon Coaker said the government should have told the Commons earlier about the fault. He added: “There must be public confidence in the government to be open and transparent on these matters. This entry was posted in UK Submarines and tagged Cooling water, Dounreay, HMS Vanguard, Leak, MoD, Nuclear, Philip Hammond, radioactivity, Submarine, Vernon Coaker on March 7, 2014 by jasonlockley.